This entry was posted in Google India Blog and tagged apps, Developer, gaming, India, indie, Play Store on April 17, 2019 by A Googler. This entry was posted in Google India Blog and tagged India on April 15, 2019 by A Googler. Gold is core to Indian culture and tradition, making India the world’s second largest consumer of gold. Indians buy gold to mark auspicious occasions each year. To make Google Pay even more useful, you can now buy and sell gold, securely from your phone, right within Google Pay! Backed by MMTC-PAMP India, the country’s only LBMA accredited gold refinery, users can buy 99.99% 24 karat gold, right within the app. The gold, which can be purchased for any value, is stored on behalf of the user, by MMTC-PAMP, in secure vaults and can be sold at any time at the latest price, refreshed every few minutes, as displayed on Google Pay. This feature is created for millions of Indians who buy gold especially during festivals like Akshaya Tritiya, Dhanteras or Diwali. Now, the purchase of gold is possible, right on your mobile phone, from wherever you are. No need to visit a jeweller during a busy festive occasion. We’re very excited to design this feature especially to meet specific needs of Indian users, and we look forward to learning from your feedback! This entry was posted in Google India Blog and tagged India on April 11, 2019 by A Googler. This week marks the one-year anniversary of the Google News Initiative. Read more about what has happened in India since then from Surabhi Malik, Program Director of the Google News Initiative Training Network and an important figure in India's fight against fake news. Two-and-a-half years ago, I joined the Google News Lab as a fellow to strengthen its mission of collaborating with journalists and entrepreneurs to drive innovation in news. Of the many areas I worked with the industry on, including data-backed journalism and visual storytelling, I kept hearing one request: help was needed with online verification and fact-checking. Online misinformation was a new challenge for everyone in India - including the news media. Some journalists described it as the biggest issue facing the industry. Many who I met during my workshops were keen to know how they could pitch in to tackle this growing menace and help their readers sift facts from the sea of misinformation around. And as the first and probably the only verification trainer in the country back then, I was equally determined to do all I could to help. The verification curriculum offered by the Google News Lab could help them navigate this maze. Built in consultation with experts at the First Draft, it provided them the best practices of online verification adopted by fact-checkers worldwide. Verification quickly became one of the most sought after trainings offered by the News Lab. In the 20 months that followed, I travelled over 133,000 miles, across 25 cities, and conducted over 150 workshops for almost 6500 journalists and journalism students. It was a rare opportunity for journalists to learn new skills on the job, and the classes were oversubscribed. To reach as many journalists as possible and offer in-depth and hands-on training, we announced the launch of the Google News Initiative India Training Network in June 2018, and invited interested journalists to sign up. The program was launched in partnership with Internews, DataLeads, BoomLive, AltNews, First Draft and Storyful. After my fellowship ended, I went on to lead this network as its Program Director working for Internews. The call for sign-ups received an overwhelming response. Journalists from newsrooms across the country - including senior editors from publications in different languages - applied and sat through the four-day bootcamps, where fact-checkers from India like BoomLive and AltNews and trainers from First Draft and Storyful provided hands-on training. Seven bootcamps and several weeks later, we had a team of fact-checkers better equipped to combat online misinformation and also motivated to help colleagues around them do the same. In the six months after the launch of the network, these ‘truth warriors’ went on to pass on the skills they had learnt, to over 5,000 journalists and journalism students. Some of them also launched fact-checking initiatives and regular columns in their newsrooms. Thanks to their commitment, readers now have ways to sift through and recognize authentic information. The journalist in me feels immense gratification to know that through each of those who joined us in this fight against misinformation, I continue striving to ensure that millions of readers get uninhibited access to nothing but the truth. There is no underestimating the scale and complexity that online misinformation poses for India and other countries. Empowering fact checking networks is but one part of a solution that requires actions from many players, but it is a step in the right direction. This entry was posted in Google India Blog and tagged India on March 26, 2019 by A Googler. Starting today, train ticket booking for Indian Railways, powered by Indian Railway Catering and Tourism Corporation (IRCTC), is now available on Google Pay! We’ve been constantly striving to bring Indian users helpful ways to make money transactions simpler, and this is another way to make the lives of our users easier through Google Pay. You will be able to search and browse train options, and book or cancel tickets with your IRCTC account, at no additional cost, within a fast, intuitive and reliable user experience. You can easily see details like seat availability, journey duration, and travel times between your stations of choice, so it is easy to compare and choose between options. Book your train tickets on Google Pay, without any extra charges, as we launch. So go ahead, update your app to check it out now! We have already seen hugely encouraging user response for cab and bus ticket booking options on Google Pay with abhiBus, Goibibo, RedBus, Uber* and Yatra. Now with IRCTC on Google Pay, your travel is made simpler even on trains. In the last year and a half since we launched Google Pay (then known as Tez), we’ve worked to develop new features to make payments simple for our Indian users. We are thrilled that millions of Indians are adopting Google Pay month on month from all over the country, in towns and villages to recharge their mobile plans, pay bills, pay for movies, book cabs, buy bus tickets and more. We will continue innovating on Google Pay to help you get to where you need to go by bus, by cab, or by train, and make everyday payment transactions a simple process for you. This entry was posted in Google India Blog and tagged #GooglePay #TrainBookings #Transit #GoogleIndia, India on March 19, 2019 by A Googler. Since introducing Google Photos, we’ve aspired to be the home for all of your photos, helping you bring together a lifetime of memories in one place. To safely store your memories, we’ve offered two backup options: Original Quality and High Quality. However, in India specifically, we heard from people using the app that their backup experience was at times longer and stalled because they might not always have frequent access to WiFi. In fact, we learned that over a third of people using Google Photos in India have some photos that hadn’t been backed up in over a month. We want to make sure we’re building experiences in our app that meet the unique needs for people no matter where they are, so last December, we began offering a new backup option in Google Photos called Express backup to a small percentage of people using Google Photos on Android in India. Express provides faster backup at a reduced resolution, making it easier to ensure memories are saved even when you might have poor or infrequent WiFi connectivity. 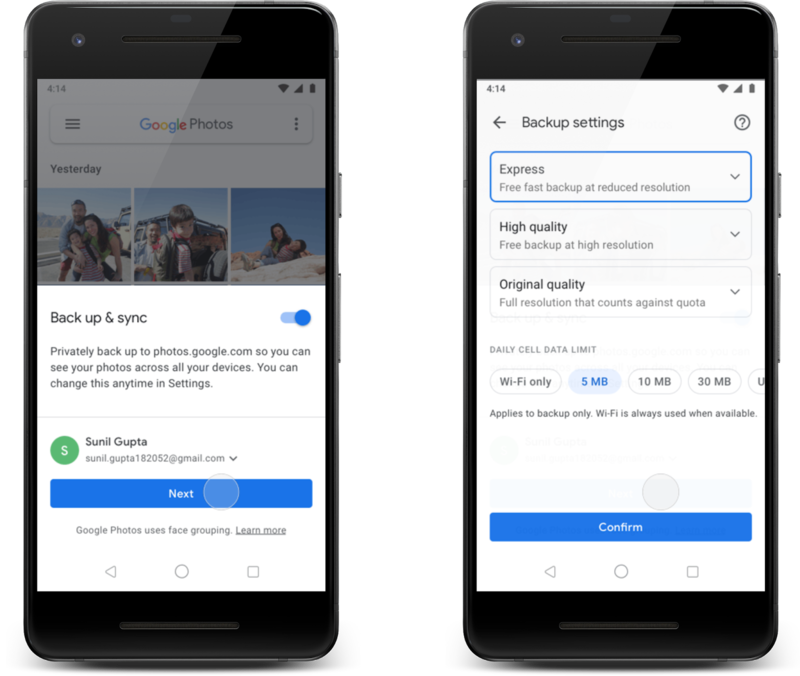 Over the past week, we’ve started rolling out Express backup to more users in India and by the end of the week, Android users on the latest version of Google Photos should start seeing it as an option for backup. In addition to Express, you will still have the option to choose from the existing backup options: Original Quality and High Quality. And, in addition to rolling out Express as an additional backup option in India, we’re also introducing a new Data Cap option for backup. This gives users more granular daily controls for using cellular data to back up. People can select from a range of daily caps, starting at 5MB. We’re starting to bring Express backup to dozens of other countries, rolling out slowly so we can listen to feedback and continue to improve the backup experience around the world. This entry was posted in Google India Blog and tagged #Photography, backup, cellular data, Google Photos, India on March 19, 2019 by A Googler. From classics like Tujhe Dekha Toh, to global sensations like Kolaveri Di, to recent rap song Apna Time Aayega, and landmark videos like Despacito, Lahore, Rangamma Mangamma, more than 1 billion music fans come to YouTube each month to be part of music culture and discover new music. It’s also where over 2 million artists come to share their voices and art with the world. YouTube is where artists and fans connect: creating and discovering a world of music. We are introducing YouTube Music, our made-for-music app with the magic of YouTube: making the world of music easier to explore and more personalized than ever to users in India. The days of jumping back and forth between multiple music apps and YouTube are over. Whether you want to listen, watch or discover, it’s all here. YouTube Music is a new music streaming service made for music: official songs, albums, thousands of playlists and artist radio plus YouTube’s tremendous catalog of remixes, live performances, covers and music videos that you may not be able to find anywhere else - all simply organized and personalized. For the first time, all the ways music moves you can be found in one place. While fans can enjoy the new ad-supported version of YouTube Music for free, we’re also launching YouTube Music Premium, a paid membership that allows you to play a YouTube music video in the background while you toggle between apps, write a text message or lock your phone while you’re going for a run, along with offline downloads and an ad-free experience for ₹99* a month. If you are a subscriber to Google Play Music, there’s good news: You get a YouTube Music Premium membership as part of your subscription each month. And if you use Google Play Music, nothing will change -- you’ll still be able to access all of your purchased music, uploads and playlists in Google Play Music just like always. 1/It’s ALL here! Not just music videos, but official songs, albums, singles, remixes, live performances, covers and hard-to-find music that one can find only on YouTube. 2/ Recommendations built for you. A home screen that dynamically adapts to provide recommendations based on the music played before and what the listener is doing. So if you are in the gym workin’ out or escaping during your daily commute, the right music is right there on the YouTube Music app. 3/ Thousands of playlists across any genre, mood, activity, or language. Try “Bollywood Hotlist”, “Featuring Drake”, “Upbeat Hindi Retro”, “Cosmic Indie Pop”, “Kollywood Hotlist” or “Tollywood Hotlist” to discover new music. 4/ Smart search so we’ll find the song, even if you can’t remember what it’s called. “That rap song with flute”? We got you. You can also search by lyrics (even if they’re wrong). It’s “Starbucks lovers,” right? 5/ The hottest videos. YouTube Music will keep you updated on what’s hot! The hottest videos in the world are right there, on their dedicated Hotlist screen. Today in India, it features Luka Chuppi, Petta - Marana Mass Official Video, Thassadiyya Full Video Song. 6/ Download your favorite tracks. For paid members your Offline Mixtape automatically downloads up to 100 songs you love on your mobile device, in case you forgot to do it yourself. And yes, paid members can also download songs, videos, albums or playlists too. Visit the Library tab to find it easily, along with your other downloaded albums, songs, and playlists. Adjust number of songs to download and more in your download settings. To extend the features of YouTube Music Premium beyond the music app, we’re also introducing YouTube Premium, YouTube Premium includes ad-free, background and offline play across all of YouTube, as well as access to YouTube Originals including Cobra Kai, BTS: Burn The Stage. But because it includes our brand new YouTube Music service, the price will be ₹129 rupees for all new members. Samsung Galaxy S10 customers have a reason to celebrate too! Samsung Galaxy S10 users can enjoy 4 months of free, uninterrupted access to YouTube Premium, which includes access to YouTube Music*. Note: *Standard eligibility applies: Offer only available to customers who are not current YouTube Premium, YouTube Music Premium or Google Play Music subscribers. At the end of the trial period, users will be automatically charged the standard subscription price unless cancelled before the end of the trial. Offer must be redeemed by March 31, 2020. This entry was posted in Google India Blog and tagged #YouTube #YouTubeMusic #MusicStreaming, India on March 12, 2019 by A Googler. In December 2018, we opened applications for Class II of Launchpad Accelerator India and are thrilled to announce the start of the new class. Similar to Class I, these 10 incredible startups will get access to the best of Google -- including mentorship from Google teams and industry experts, free support, cloud credits, and more. These startups will undergo an intensive 1-week mentorship bootcamp in March, followed by more engagements in April and May. At the bootcamp, they will meet with mentors both from Google and subject matter experts from the industry to set their goals for the upcoming three months. During the course of the program, the startups will receive insights and support on advanced technologies such as ML, in-depth design sprints for specifically identified challenges, guidance on focused tech projects, networking opportunities at industry events, and much more. The first class kicks off today in Bangalore. (8) HRBOT: Using AI and video analytics to find employable candidates in tier 2 and tier 3 cities, remotely. This entry was posted in Google India Blog and tagged AI, India, Launchpad Accelerator, ML, Startups on March 11, 2019 by A Googler. New inventions have fueled fantasies and shaped human society — from the first stone tools to robotic arms, the steam engine to jet propulsion, pieces of paper to the internet, hieroglyphics to emoji. Take the telescope, for example. Today, the Hubble Space Telescope orbits 340 miles above the Earth, capturing crisp images of 10,000 galaxies that are up to 13 billion years old. The idea for the telescope was born in 1608 from Dutch spectacle-maker Hans Lippershey's idea, and Galileo Galileo later improved the design, then pointed it at the sky. Several decades and conceptual explorations later, Govind Swarup built two of the world’s largest radio-telescopes near Ooty and Pune. Today, we’re celebrating the objects and ideas dreamt up and created by inventors, scientists and dreamers. Thanks to over 110 institutions, including National Council of Science Museums and Tata Institute of Fundamental Research from India, as well as dedicated curators and archivists from 23 countries around the world, you can explore a millennia of human progress in Once Upon a Try, now available on Google Arts & Culture. With over 400 interactive collections, it’s the largest online exhibition about inventions, discoveries, and innovations ever created. In addition to the exhibition, you can download a “Big Bang” augmented reality app, which we developed in collaboration with CERN, the European Organization for Nuclear Research. In the app, you’ll embark on an epic 360-degree journey through the birth and evolution of the universe. With Tilda Swinton as your guide, witness the formation of the very first stars and watch planet Earth take shape in the palm of your hand. Using Google’s machine learning, you can also explore NASA's vast archive of 127,000 historic images with a new tool called NASA's Visual Universe. See the history of discoveries and missions, or search for a term to learn more about the space agency. You can also tour Space Shuttle Discovery — based in the Smithsonian National Air and Space Museum — in 360 degrees, with the astronauts who once called it home as your hosts. Within the Once Upon a Try exhibition, you can dive into virtual walkthroughs to tour the sites of great discoveries, from the deep underground of CERN to the high-in-the-sky International Space Station. Zoom into 200,000 artifacts in high definition, like the first map of the Americas and Saturn and its 62 moons. Get the lowdown on big inventions (from zero to emoji to the toilet) or hear five inspirational scientists talk about superpowers — like shapeshifting — that are being created through science. Meet the Einsteins and Curies, or learn more about champions behind-the-scenes — like Chewang Norphel, the man single-handedly combating climate change with artificial glaciers, or Rajnish Jain, who found a method to harness electricity from pine needles, or Mary Anning, the pioneering female paleontologist who discovered the pterodactyl. Woven through the exhibition are tales of lucky accidents, epic fails and even people who died for their projects — like Röntgen’s fluke discovery of x-rays, Isaac Peral’s ingenious electric submarine that never launched and Marie Curie’s quest to find polonium, which led to her own death from radioactive poisoning. Despite these setbacks, human endeavour is a never-ending journey — and you can imagine that only a few things are as exhilarating as that “eureka” moment when everything falls into place. Get all the tips you need to become and inventor, and learn why it’s important to embrace failure through the stories of pioneers like Ada Lovelace, Mae Jemison and Chien-Shiung Wu. We hope this tribute to human discovery inspires a new generation of creators to be curious, to seek what lies beyond the known and to try something new. Explore “Once Upon a Try” on Google Arts & Culture or via our iOS or Android app and join the conversation on #OnceUponaTry. This entry was posted in Google India Blog and tagged Google Arts & Culture, India, Innovation, Inventions, Museums on March 6, 2019 by A Googler.